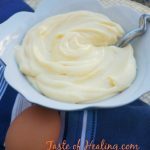 The taste of fresh mayonnaise is far superior to store bought; this easy Mason jar method is a game changer, quick, easy and delicious mayonnaise in a snap! Place the stick blender in the Mason jar, resting on the bottom, and begin blending, keeping it on the bottom until the mayonnaise begins to creep up the sides. Lift the blender slightly to blend through. Taste for seasoning. Store in fridge till needed. * Note: This recipe contains raw egg yolk, dip the egg in boiling water before opening as salmonella contamination is usually on the shell. Know your source of eggs and proceed at your own discretion.